There’s nothing we love more than curling up with a warm cup of hot chocolate, especially when it is absolutely baltic outside. Insomnia has warmed our hot-chocolate loving hearts with their latest release. 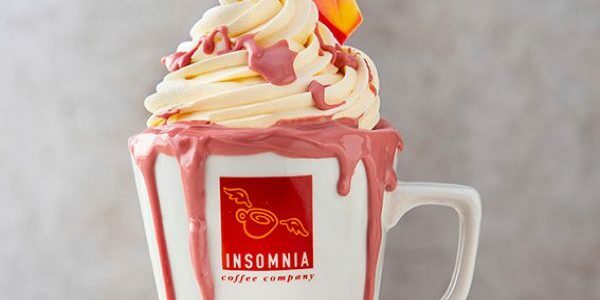 Insomnia, partnering with Callebaut, presents the fourth type in hot chocolate ‘Ruby’ next to Dark, Milk and White chocolate. The first Coffee Shop Chain in Ireland to sell Ruby Hot Chocolate, it is made from the Ruby cocoa bean with a unique, berry flavour. It also, as its name suggests, is ruby in colour and has the natural tone of the Ruby bean. Insomnia has added no berries or berry flavour or colour when preparing the Ruby Hot Chocolate. Leading the way in new product innovations and always looking to introduce tastes that will delight their loyal customers, Insomnia is delighted to add a new star to their Hot Drinks range and introduce the Ruby Hot Chocolate into stores nationwide from Friday, March 15. Sarah Hartnett, the award-winning Pastry Chef Consultant and Callebaut Ambassador, was instore with Insomnia to launch the new taste sensation Hot Chocolate. Sarah hosted her Coco Horizons chocolate demonstration to showcase the versatility and flavour of the Ruby chocolate. Ruby chocolate has an intense taste and characteristic reddish colour. The cocoa beans are sourced from different regions of the world and are the work of global R&D centres of Barry Callebaut, based in France and Belgium – part of a global network of 28 R&D centres-, the Jacobs University, and over 175 years of expertise in sourcing and manufacturing. “We are rubyliciously excited to rollout Ruby Hot Chocolate in our Stores,” said Harry O’Kelly, Insomnia CEO. "We are renowned for our hot chocolate and Insomnia’s customers have come to expect a high standard of quality and service from us, including the extending of product lines with innovative, taste fantastic foods.